5.0 Earthquake hits off the coast of northern California. Tropical cyclone 11p (Dylan), is located approximately 290 nm south-southeast of Cairns, Australia, and is tracking south-southwestward at 09 knots. Land interaction will lead to the complete dissipation of the system. Torrential rain and wind gusts up to 140km/h are battering north Queensland as cyclone Dylan makes landfall. The Bureau of Meteorology says the category two cyclone made landfall near Proserpine, north of Mackay, just after 4am on Friday. Forecaster Chris Joseph said the storm is moving about 16km/h in a southerly direction and is expected to head inland in the next three to six hours. 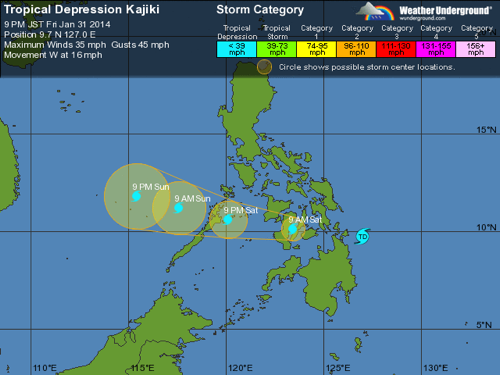 “It is still a dangerous storm,” he said. Wind gusts up to 135km/h were felt at Flinders reef, about 250 kilometres off Bowen. Heavy rain is battering much of the north Queensland coast. Numerous reports of damage were received by local authorities. Environmental and wildlife advocates slammed Western Australia’s move to begin killing sharks along the Indian Ocean coast at the southwest tip of the country in the wake of seven fatal shark attacks within the past three years. The cull comes as marine biologists around the world warn that some shark species are becoming endangered due to overfishing and mutilation for their fins. 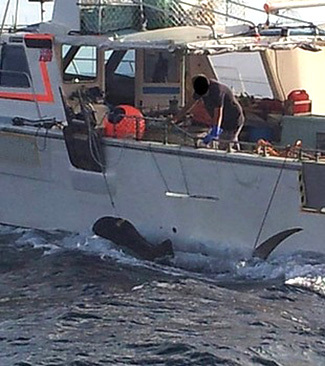 The Western Australia government allowed contract fishermen to place baited hooks on drum lines off popular beaches in the state capital of Perth and to the south to kill white, bull and tiger sharks over 10 feet long. The first shark killed was shot and its carcass dumped at sea. A new poll by the leading UMR research company finds that 82 percent of Australians don’t think the sharks should be killed and say people enter the water at their own risk. But Western Australia’s leading politician doesn’t agree. “When you have sharks that are three, four, five metres long of known aggressive varieties, swimming in the water very close to beachgoers, that is an imminent danger,” said Premier Colin Barnett. Activists have pledged to interfere with the killings with tactics like removing bait from the drum lines. The week’s hottest temperature was 114.1 degrees Fahrenheit (45.6 degrees Celsius) at Oodnadatta, South Australia. The week’s coldest temperature was minus 69.5 degrees Fahrenheit (minus 56.4 degrees Celsius) at Russia’s Siberian community of Selagoncy. Etna (Sicily, Italy): The recent eruptive episode, which could be called a mainly effusive paroxysm, seem to have more or less ended. Activity if still present (weak explosions at the NSEC and lava effusion from the fissure vent at its base) has decreased a lot. Visibility and weather are bad at the moment to have a more detailed picture. Sinabung (Sumatra, Indonesia): Lava effusion continues at the volcano and pyroclastic flows occurred this morning. During the past 7-10 days, the growing lava dome has effused an impressive thick extrusion lobe that managed to form a massive, approx. 800 m long coherent lava flow reaching the base of the mountain. The sticky lava flow followed and almost completely filled the deep ravine on the SE side of the volcano which before channeled the rockfalls and pyroclastic flows. Dukono (Halmahera): (29 Jan) New explosions produced an ash plume this morning rising to 12,000 ft (3.6 km) and drifting 40 nautical miles to the southeast (VAAC Darwin). Reventador (Ecuador): Activity at the volcano continues at moderate levels according to IG, but for the first time since a while, new ash emissions and incandescent material were reported. Since the afternoon of 28 Jan, the volcano’s seismic signal showed episodes of continuous emission tremor and glowing material was seen descending on the eastern flank. A thermal hot spot is also visible on MODIS satellite data, suggesting that lava effusion from the dome has increased. Tungurahua (Ecuador): A new eruptive phase has begun at the volcano. Since the early morning today, the seismic network detected an increase in earthquakes including signals of small explosions and long-period events and tremor typical for internal fluid movements (gasses and magma). The Tungurahua volcano Observatory while unable to make direct visual observations received reports from observers that fine black ash fell in Pungal and Penipe, and minor amounts in Palictahua. The black color of the ash suggests that it originates from fresh (so called juvenile) magma. On 29 January 2014, the National Health and Family Planning Commission (NHFPC) of China, and the Centre for Health Protection (CHP), Hong Kong SAR, China notified WHO of twenty-one (21) additional laboratory-confirmed cases of human infection with avian influenza A(H7N9) virus including one death. Tropical cyclone Eleven is located approximately 160 nm east-southeast ward of Cairns, Australia. Residents in northeast Queensland have been warned that a tropical low is forming off the coast this week and could quickly develop into a cyclone, to be named Dylan. The storm would be the first to hit this part of the country in more than two years, and it brings the potential for damaging winds, heavy rainfall and flooding from higher than normal tides. 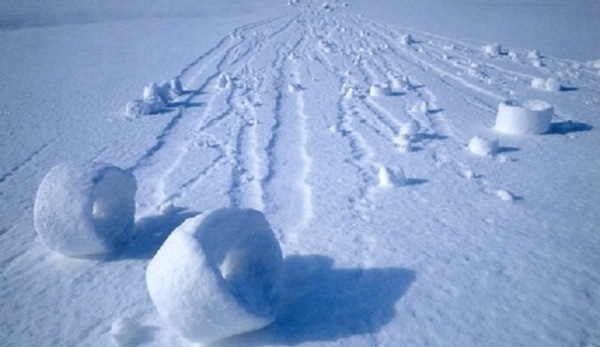 The naturally occurring snow balls form where ice or ice-encrusted snow exists in a uniform layer over the ground. The surface layer serves as a platform where the balls are formed and can easily travel. The second layer, which rests on top of the ice, must be wet snow that is fluffy and loosely packed. This condition can be difficult to meet as wet snow is often quite dense. New floods cause chaos across Greater Jakarta as the floods returned on Wednesday after incessant rain hit the capital overnight, forcing hundreds of residents to wade back to evacuation shelters. The 15-second animation, which was posted by NASA last week shows a view of the entire globe with an overlay that details climate change. 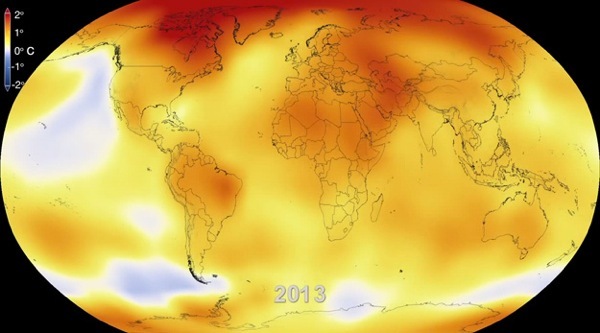 NASA scientists analyzed data collected over the past 63 years by 1,000 meteorological stations from around the world, and the animation they compiled shows just how rapidly the Earth’s climate is changing. If your browser does not support animation, download the first image to your computer and view it as an animated .gif. As California’s drought deepens, 17 communities across the state are in danger of running out of water within 60 to 120 days, state officials said. On 27 January 2014, the National Health and Family Planning Commission of China notified WHO of six additional laboratory-confirmed cases of human infection with avian influenza A(H7N9) virus including one death. 5.4 Earthquake hits Tarapaca, Chile. 5.1 Earthquake hits western Iran. 5.0 Earthquake hits Reykjanes Ridge. 5.0 Earthquake hits off the east coast of Honahu, Japan. Tropical cyclone Eleven is located approximately 69 nm east-northeast of Willis Island, Australia. A cyclone warning has been issued for parts of north Queensland as a tropical low gathers strength and heads towards the coast from Port Douglas, north of Cairns, south to Mackay. U.S. – A rare and dangerous ice storm has begun in the Deep South, where Winter Storm Leon is tracking along the northern Gulf Coast, spreading a nasty mix of freezing rain, sleet, cold rain, and snow along a swath from Central Texas to Eastern Virginia. Freezing rain was falling at a temperature of 28°F in Austin, Texas, where a 20-car pileup on an overpass was reported, as well as at least ten other car crashes in a 30-minute time span. A portion of Interstate 35 was closed due to the crashes and icing. Freezing rain was falling on the north side of Houston, Texas, and in Mobile Alabama. Snow was falling in Jackson Mississippi, and sleet in Baton Rouge, Louisiana. The National Weather Service posted Freezing Rain Advisories along a swath from Eastern Texas across Southern Louisiana, Southern Mississippi, Southern Alabama, the Florida Panhandle, almost all of Georgia and South Carolina, and into Eastern North Carolina, Virginia, and Maryland. Ice accumulations of 1/4″ – 1/2″ are expected in much of this area, with isolated higher amounts. Snows of 1 – 4″ were possible just to the north of the freezing rain swath, with heavier amounts of 6 – 12″ across southeast Virginia and northeast North Carolina. The ice storm has the potential to cause significant damage to trees and power lines, resulting in widespread power outages. Travel will be very dangerous in a region unaccustomed to extreme winter weather. 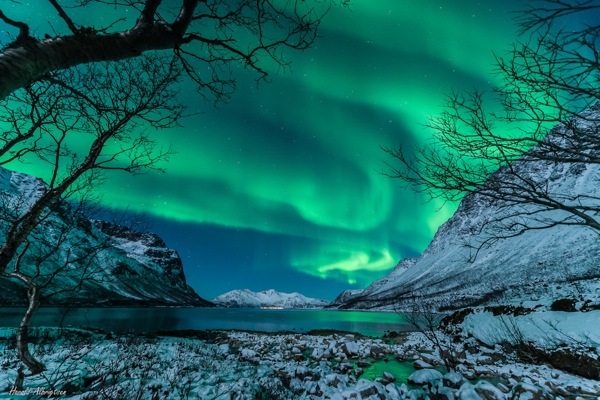 The northern lights dance across the sky, creating an ethereal glow that illuminates the darkness, in this jaw-dropping photo taken from Norway. Russian authorities on Tuesday reported a suspected outbreak of foot-and-mouth disease in eastern Siberian region of Zabaikalsk, which borders China and Mongolia. The Veterinary and Phyto-Sanitary Surveillance Service (VPSS) said clinical signs of the disease were identified in samples of cattle at a private farm, adding measures to contain it were being taken. Samples have been sent for diagnosis.